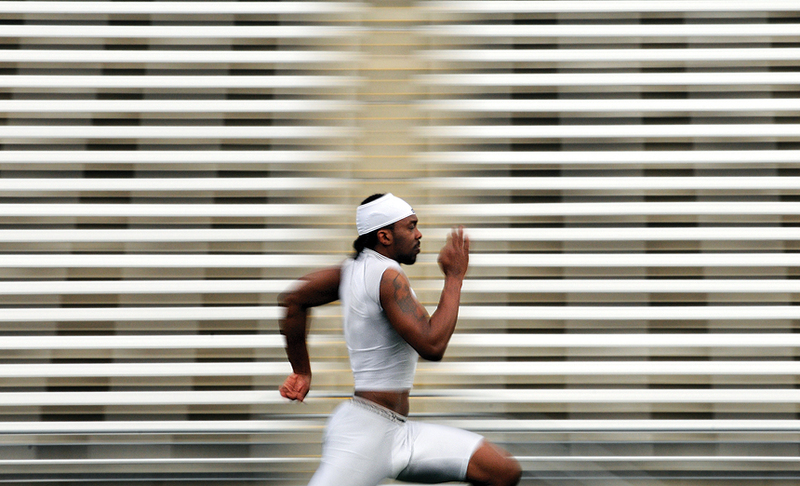 "Towson University wide receiver Dayron Arnold accelerates through the 40-yard dash during the 2008 NFL Pro Day at Johnny Unitas Stadium, Wednesday, March 12. Arnold was one of 10 Towson football players trying to impress NFL scouts with hopes be invited to one of the 32 team's training camps." Well, I was completely wrong in thinking that I would be treated with respect Wednesday morning at NFL Pro Day. Without repeating myself too much, NFL Pro Day at Towson University is a one-day event much like the NFL Scouting Combine, but to a lesser degree. At the NFL Combine, over three hundred of the top college football players are invited to participate in the four-day opportunity to try out for the NFL. Personnel from all 32 NFL teams evaluate the nation's best college football players in preparation for the NFL Draft in April. Conversely, at Towson only a handful of athletes show up to try and impress a select amount scouts. They are put through everything from being weighed and bench pressing, to running the 40-yard dash and other agility drills. The event was not a big as last year. I counted only three NFL scouts and roughly 10 Towson football players. Last March there were many more players and scouts. However, the way we were treated was no different than last year and it puts a bad taste in my mouth. From the very start I knew it was going to be a long morning. I met Matt Vensel (the reporter) at Towson around 8:30 a.m. to make sure we could find everyone. Promptly at 9:00 a.m. we hear, "I am out of here at 10:30 a.m. whether or not we're done," the gentlemen running the event, said. The morning got underway and we followed the players to where they would be weighed and measured. As I mentioned in my last post, I was concentrating mostly on Brian Bradford. As Vensel and I stood in the back of the room, out of the way of everyone, I snapped a couple random pictures when I hear, discourteously, "Who are you with?" Rudely followed by "Get out of here, I don't want you here or this published in a newspaper." Calmly, I said we were allowed to be there with permission of the coach and we had covered the event in the past. Apparently, that was not enough as we were commanded to leave, again. Disappointed and frustrated, we walked out to the field where the players would be afterward. Thankfully, we didn't get any more remarks from the gentleman running the event. I don't get it. I fully understand this gentleman is doing his job and looking out for the best interest of the prospective athletes, but the way we were called out impolitely is completely off key. He could have kindly asked if we could leave or approached us in a different, civil way. This gentleman was more concerned on what we were doing, rather than the players trying to impress scouts out and himself. I know if I were focusing on others actions rather than my own that my work would suffer significantly. After being treated like this two years in a row, it makes me wonder if all those representing professional NFL teams are in some degree the same way. I would hope not. And honestly, when we were kicked out, they were measuring hands. I don't think anyone reading an article would be concerned over hand size versus a 40-yard dash time. "Sir, while your attention to me is somewhat flattering, I think it would be better if you focused on actually doing your job, instead of worrying about me doing mine." Deliver that with a large smile. After that, develop deafness. If he becomes irate and threatening, TAKE PICTURES OF HIM!